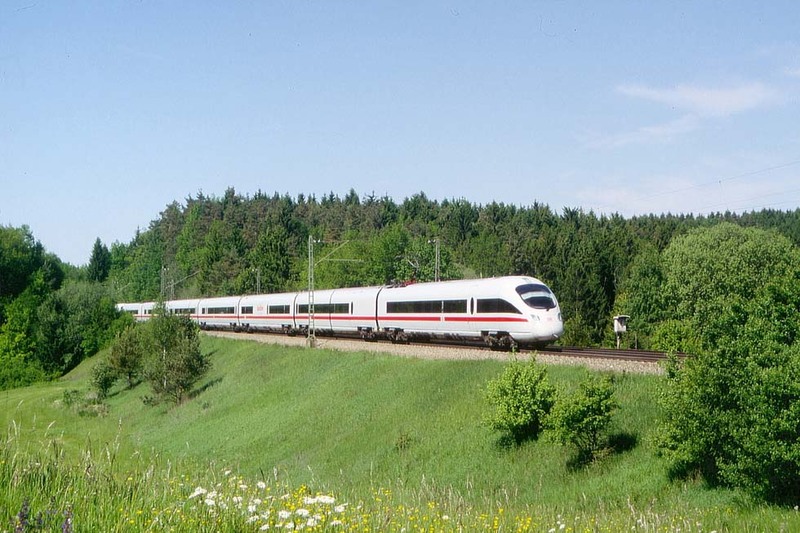 Only electric high-speed Intercity day trains, more cost-efficient than exclusive 1st class or sleeper services, achieved a substantial traffic growth - in Germany initially combated by some press, thus helping the motorcar industry, and by "environmentalists", unwittingly favoring pollution, not nature. First true high-speed trains were the Japanese Shinkansen, started in 1964, followed by the French TGV "trains a grande vitesse", delayed by politics. The first TGV was completed in 1972, gas-turbine powered and thus not bothering the oil industry. The electric TGV was ready in 1978. 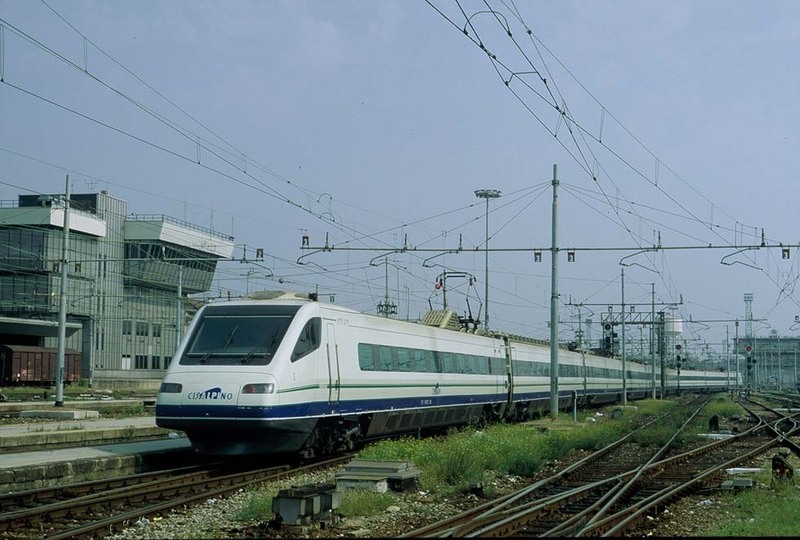 The first TGV line Paris - Lyon opened in September 1981, the Italian Direttissima in 1988, the German Nord-Sued ICE track not before 1991, with a quarter of a century delay. The most spectacular new link became the Channel tunnel. The Paris - London Eurostar started in 1994. The curved glass terminal at London Waterloo is a masterpiece of architect Nicholas Grimshaw, The British high-speed section however was built not before in 2003. Insufficient financial results of the Eurotunnel Co. with a debt of 6.2 billion pound (according to Daily Telegraph July 14, 2006) became obvious, but 7 Eurostar trains, ordered for services from Paris to cities north of London, had remained stored until GNER used them at least for domestic services. There was even the idea of cancelling the London - Brussels Eurostar! Then came a more logic proposal: Instead of closing down Channel tunnel services, they could be extended to Amsterdam and Germany. The necessary change of security regulations came on the agenda. And the Eurostar should go also to cities north of London. In the UK however an early concept of privatization had hampered development of a true high-speed network, at the benefit of short-haul airlines, though the London Heathrow airport is dangerously overcharged. 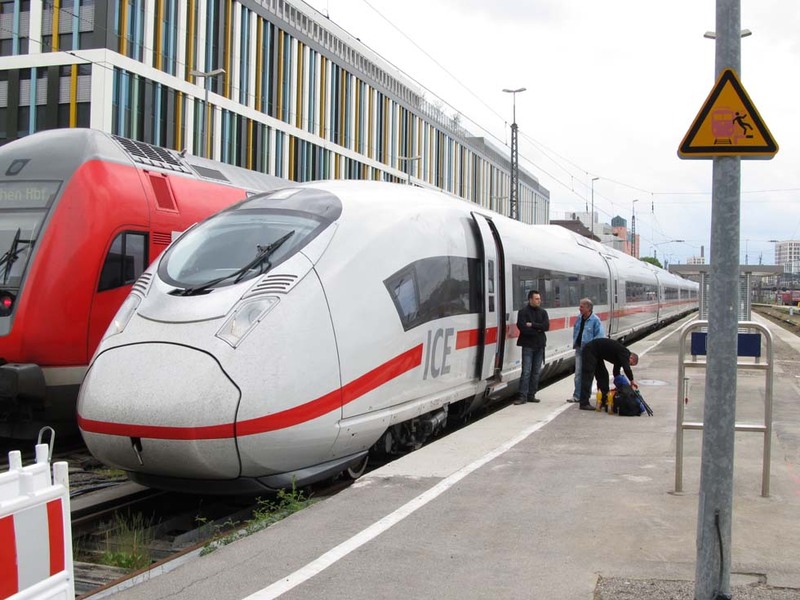 After long negotiations, German DB published in 2009 the intention of running ICE high-speed services to London. Links between Denmark and Sweden by tunnel and bridges were opened in 2000, but the lack of high-speed lines Sweden- and Norway - Denmark limited railways’ success. Germany introduced between Hamburg and Copenhagen the diesel-powered ICE-TD and in 2008 construction of the Fehmarn Belt bridge was concluded, linking Scandinavia with the continent, (opposed by environmentalism in favor of air-polluting ferries and planes). Then the tunnel project was published (once again criticized by environmentalists, seeing the whales endangered, while in Hawaii the ferries were combated with this argument), but in 2011 the Danish government approved the railway tunnel, to be completed in 2020. The LGV Strasbourg - Lyon enabled to open high-speed services Frankfurt – Marseilles in 2012. Initially only TGV Duplex trains were used, as Germany suffered a shortage in ICE material. Already Inin December 2005 a TGV Geneva - Marseilles had started. TGV Lyra trains linked Paris with Switzerland. 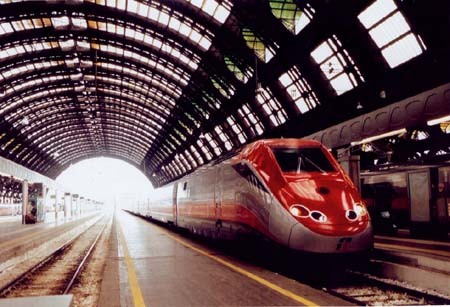 Expensive tunnels are necessary for connecting Italy by international high-speed lines. A new tunnel in the Alps is the modern Loetschberg tunnel, completed in 2008, to be followed by the Gotthard Base Tunnel, with 57 km length world’s longest, expected for late 2016, Together with the Ceneri Base Tunnel north of Lugano, anticipated for 2019, it could link Italy with a European high-speed network. However, the press praised it for freight, possibly not covering the high cost. 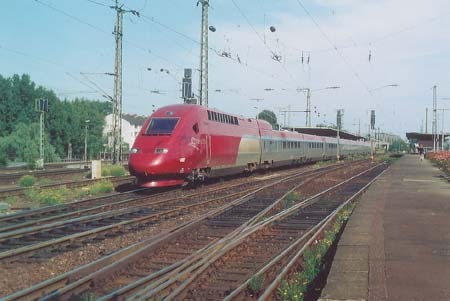 The Swiss interest in acquiring the German IC-x for Frankfurt – Milan services, published in 2012, opened better prospects. A gigantic bridge to Sicily, announced for completion in 2011 (and opposed by a shipping “mafia” and reportedly also by Italian railway authorities), should connect Palermo with the high-speed network. Though it was favored by Berlusconi, the project was abandoned. A high-speed line became proclaimed to link Southern France with Italy via the Mont Cenis region and another one via the Cote d’Azur. The line Lyon – Torino, estimated at a cost of 15 billion euro, with its 53km long Mont Cenis base tunnel should become an essential part of a southern east-west connection. 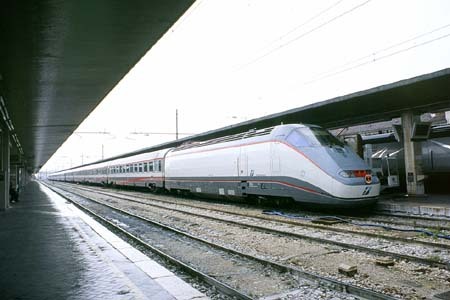 However, Italy’s outsiders, the Refounded Communist Party, “made a mark opposing large European infrastructure projects like the high-speed train between Italy and France” (Newsweek, April 24, 2006). In 2012 Sueddeutsche Zeitung (March3) reported that on the French side there was no resistance against the project, while in Italy “from Torino to Palermo the protesters have occupied roads and railway stations, have demonstrated at the places of Rai television and have occupied the head office of the social-democratic party PD (…). Politicians of all parties condemned the violence (…). Responsible are primarily militant groups of Black Blocks…” It is not known, who is financing them. In Austria the Brenner- and the Semmering-Basistunnel projects were politically combated for decades. The Brenner-Basistunnel at an estimated cost of 6 to 10 billion euro was planned for accelerating passenger train services Germany – Italy. Around 2010, when EC trains were combated by Italian state railways, arguments changed to truck transport, which would have to be subsidized by the taxpayer, for the road is cheaper. The Alpine tunnel projects must open international high-speed services, if Europe wants to present itself as a common economic space. 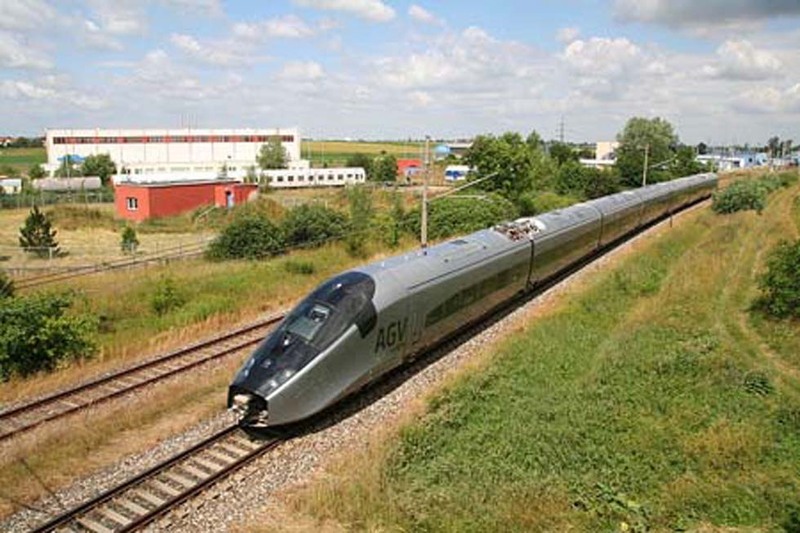 In 1988 the German ICE1 attained on tests 406 km/h and the TGV Atlantique two years later 515 km/h or 320 miles per hour. TGV Atlantique was world's first train to run regularly at 300 km/h and in the meantime France got experience with 320 km/h in regular service. The Eurostar and other TGV derivatives proved that different current systems are no longer a problem. 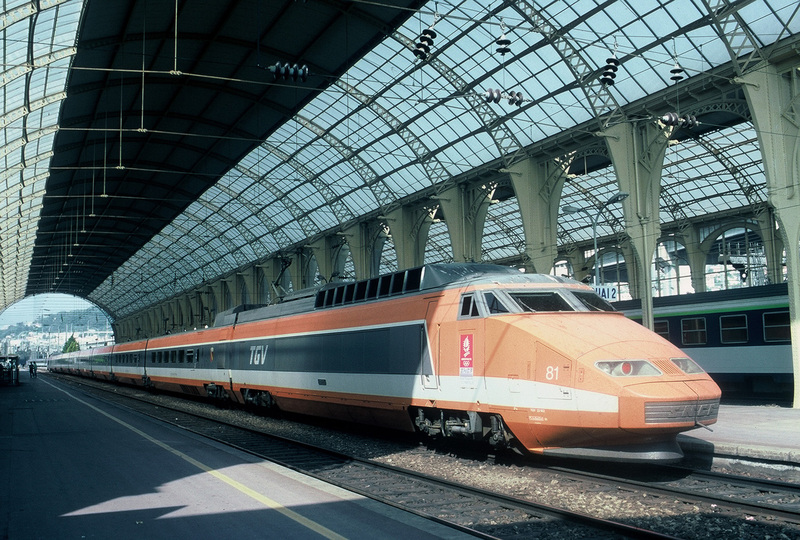 The TGV Thalys connects Paris with Amsterdam and Cologne from 1996 and 1997. A TGV Reseau started in 1996 services Paris - Torino - Milan. Italy's high-speed train ETR500 got a 3-current derivative, known also as ETR500P, which became tested in France for services Milan - Torino - Paris. With the direttissima Rome - Naples, Italy changed to the 25kV ac system instead of 3kV dc. Other lines were to follow, new 3-current ETR500 trains were built and the older ones got the engine units replaced. Between Rome and Naples a speed of 300 km/h was attained. 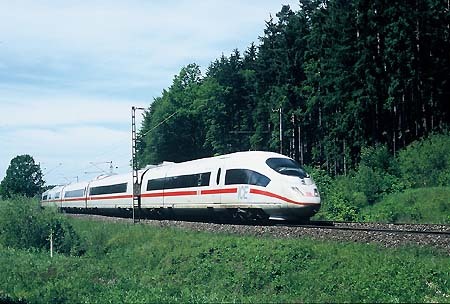 In 2000 Germany had introduced the ICE3 for 300 km/h, capable of running at 320 km/h. With "distributed power" like the Japanese Shinkansen or the earlier German 403 of 1973, it avoided the uneconomic heavy-weight power units used on TGV, Eurostar, ICE1, 2 and ETR500. The multi-current ICE3M version of the ICE3, used also by Dutch railways, opened up services Amsterdam - Cologne - Basle and Frankfurt - Brussels. 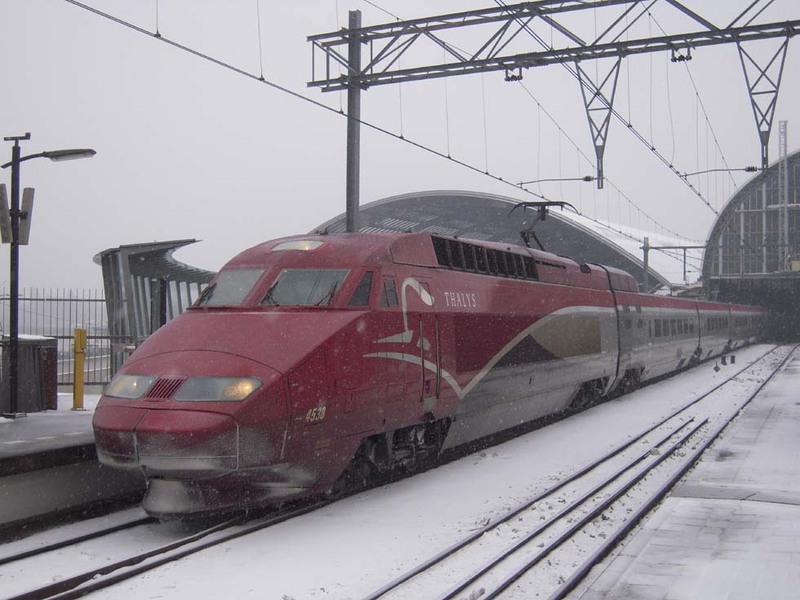 In 2003 the ICE3M undertook tests in France and finally it was allowed to enter France regularly, but sometimes it was replaced by a TGV. The double-deck TGV Duplex of French Railways increased high-speed trains' capacity. In 2007 itthe TGV established a new speed record with 574.8 km/h. After the TGV, Alstom started development of the AGV, like the ICE 3 with distributed power. 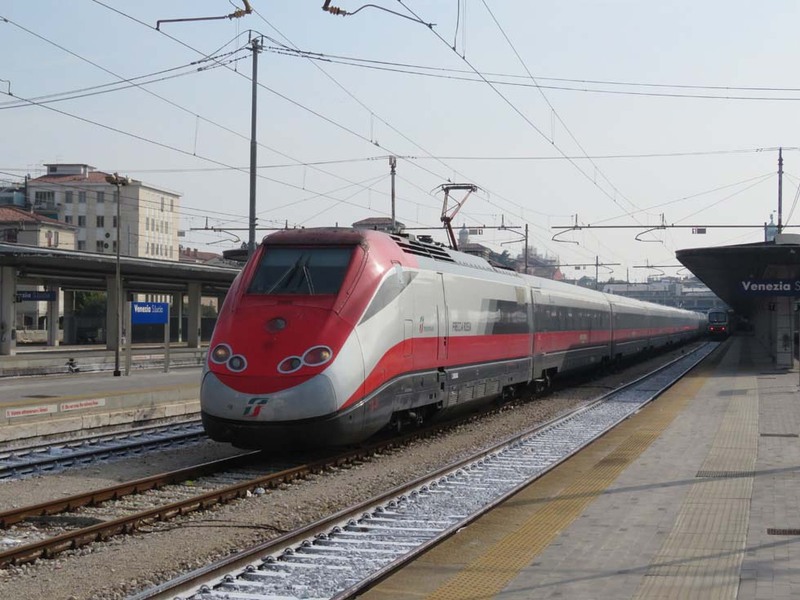 A speed of 350 km/h had come into consideration and it became true with the "Velaro E" version of the ICE3 for Spain, offered also to Italy, but Ansaldo-Breda and Alstom were victorious. A Velaro type version of the ICE3 is developed for Germany and for the slower IC trains a replacement by an IC-x option from 2016 onwards came on the agenda. 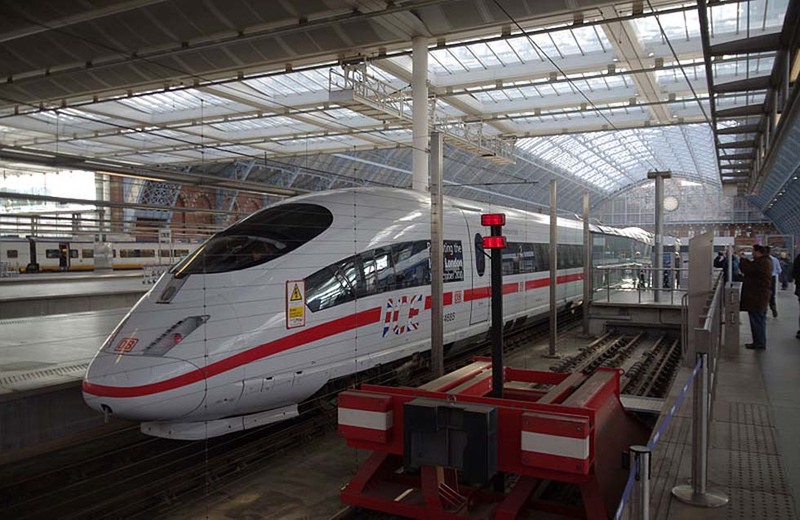 In 2010 the German ICE3M was presented for the first time at London St. Pancras, then the Eurostar terminus. 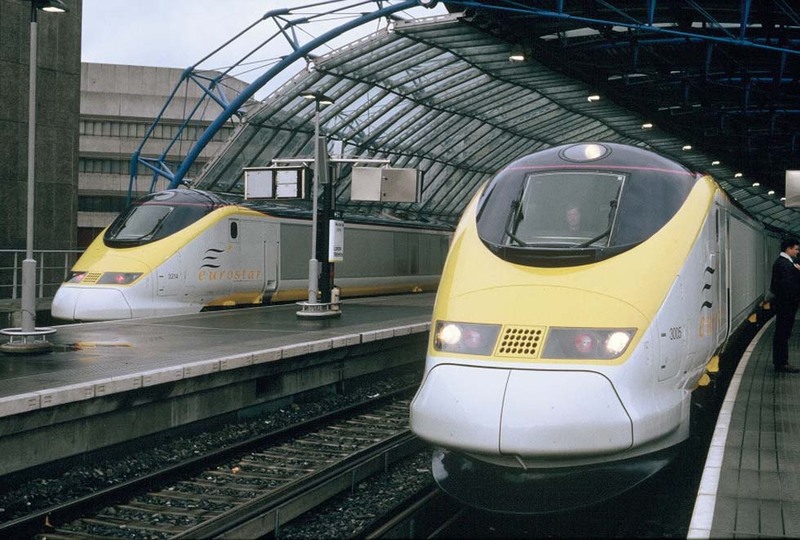 An order for ICE-based Eurostar Channel tunnel train sets was placed with Siemens - and a London court rejected a competitor's lawsuit. Services Frankfurt - London were expected already for 2013, like also services Amsterdam - London. 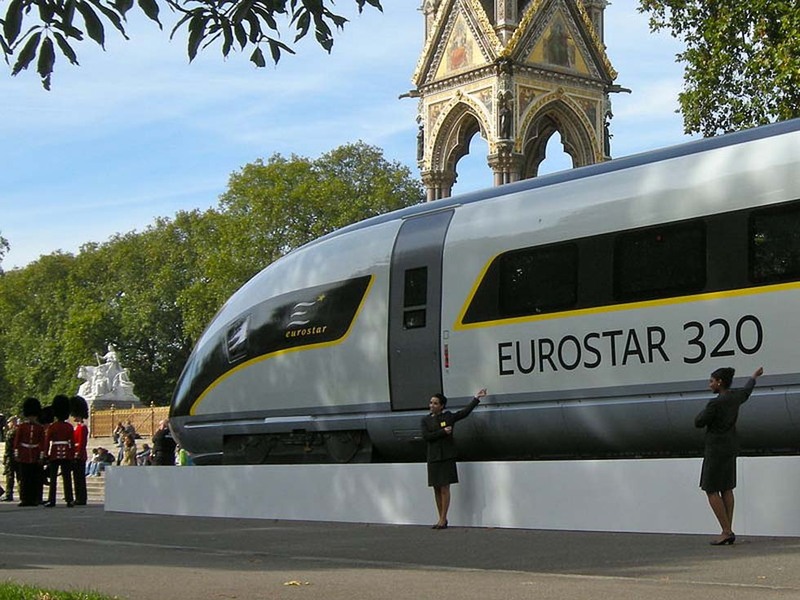 In late 2010 the Eurostar 320, the Siemens Velaro type, was presented in London. Among the so-called "intermediate high-speed trains", Railway Gazette International (July 2009) listed for the UK the Southeastern class 395 from Hitachi, for the Netherlands the class V250 from AnsaldoBreda, for Spain the classes 104, 114, S-120, S-121 from CAF-Alstom and for Turkey the class HT65000 from CAF (see main chapter Middle East). For slower lines an increase in speed was targeted by tilting "pendolino" trains. In the USA those "Pendulum Cars" had been constructed already before the war by aircraft builder "Jack" Northrop and engineer C.T. Hill. They were tested by the Santa Fe, but World War II prevented a further development. The breakthrough was achieved by Fiat engineer Andreas Parnigoni. The "Pendolino" prototype ETR 401 was built in 1975. In 1988 the ETR 450 of FS appeared on the Milan - Rome run, followed by the ETR460. With the ETR 470 the Swiss-Italian Cisalpino consortium, founded in 1973, introduced new services Switzerland - Italy. Opening of the Loetschberg - Basistunnel improved services Basle - Milan and new CIS units were announced for a speed of 250 km/h. Not being allowed to extend the services to Frankfurt, an extension southward to La Spezia and Rome was considered. For the Brenner line a Cisalpino had been proposed, but it remained a matter of discussions. Around 2009 a replacement of the tilting CIS units by conventional train sets was announced and an unfair private propaganda appeared in the Internet. 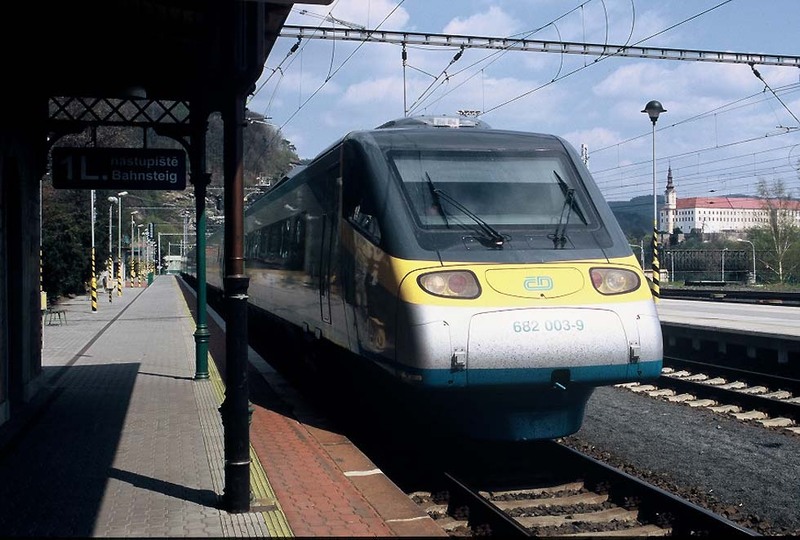 A new tilting ETR610 type was introduced in 2010, but in the same year Cisalpino was dissolved, swallowed by SBB and FS. And the ETR470 continued running in Italy, joined by the ETR600. Switzerland had started its own tilting ICN for domestic services. Czech Railways introduced the 680 class pendolino trains, initially intended for joint-stock services Berlin - Prague - Vienna. Slovenia started the EC "Casanova" Lubljana - Venice with the 310 series (ETR 470/ 480). German DB ordered instead of its diesel-powered ICE-TD more electric ICE-T2 tilting trains. Nevertheless the ICE-TD was introduced on a Copenhagen service from Hamburg, temporarily even from Berlin. The Oresund Bridge between Sweden and Denmark had been completed already in the year 2000. Stockholm was connected with Copenhagen by Swedish X2K (X2000) electric units, and then the Swedish-Norwegian company Linx AB took over with the X2N derivative, adding an Oslo - Copenhagen service in 2003, but the unsuccessful attempt ended in 2004. Every passenger train Oslo - Copenhagen vanished and SJ saved at least a Stockholm - Copenhagen service. Sweden remained also without adequate train connections with Germany (only a privately owned "Berlin Night-Express" Malmo - Berlin via the Trelleborg - Mukran ferry of Scandlines provided a service). Swedish politics had considered true high-speed lines unnecessary and only very late a few new sections were built. Decades ago Sweden had abandoned development of the KLL lightweight low-gravity center day train resembling the Talgos and the German VT10, but with a new system of articulated bogies. In Finland a first high-speed line was built, used by Sm3 tilting train sets. In the UK, airline pioneer Richard Branson founded Virgin Trains and introduced Fiat pendolino electric units on the West Coast Main Line, starting with London - Manchester in 2003, followed by Glasgow, Liverpool and Holyhead services, more competitive than slow conventional trains. But contrary to a widespread opinion, the tilting-technology does not improve safety and therefore it is no equivalent to new high-speed lines. DB locked the tilt of the ICE-T out of use, but for accelerating services at least on slower lines, tilting technology proved to be an advantage and finally re-introduction of tilting technology for the ICE-T was announced. . The new railway age got its new aesthetics. Traditional railway coaches were looking like furniture trucks, as the former DB design boss Schuh expressed it, caused by stringent European UIC rules. And still now they are hand-coupled, like in the 19th century! High-speed trains escaped from these restrictions. Already before WW II, Pagana in Italy had given the ETR200 a strikingly futuristic appearance. Pininfarina continued it with the ETR 500. Then their pastel/green color scheme was replaced by two-tone grey and the interiors were refurbished by Zagato. 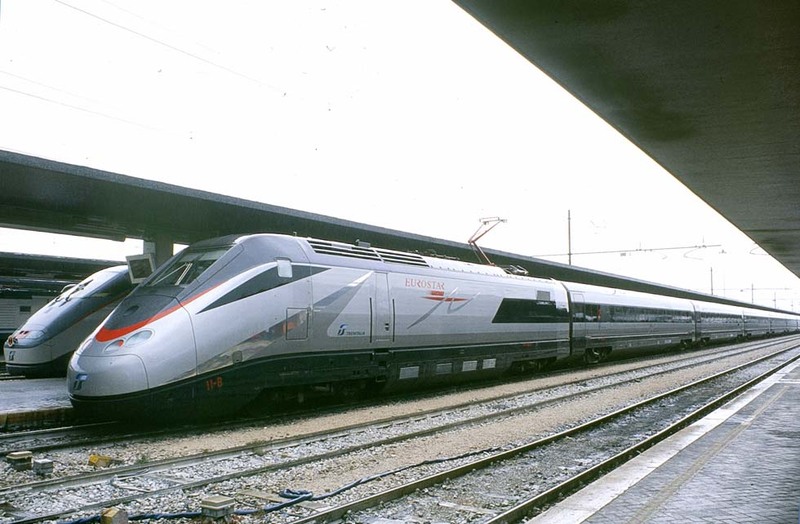 Giugiaro had re-styled the Pendolinos, beginning with the ETR460 and he created the futuristic design of the E402B locomotives. Jacques Cooper's TGV design, influenced by Paul Arzens, originally painted orange, then grey/blue (Thalys grey/dark-red), was exceeded by DB design center's cool "white shark" look of the ICE1. A curious feature of early German ICE trains is the mixture of open saloons (Ap, Bp), offering also "window seats" without window and uneconomic old-style compartments (Av, Bv). 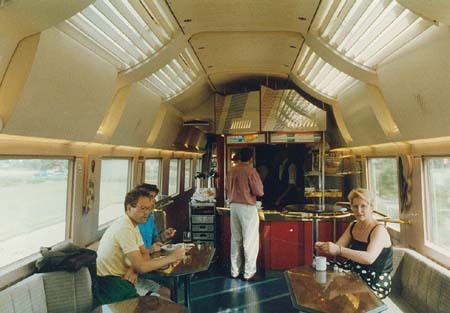 The ICE1 included a magnificent dining- and buffet-car, conceived by Peter Lankes, DB. 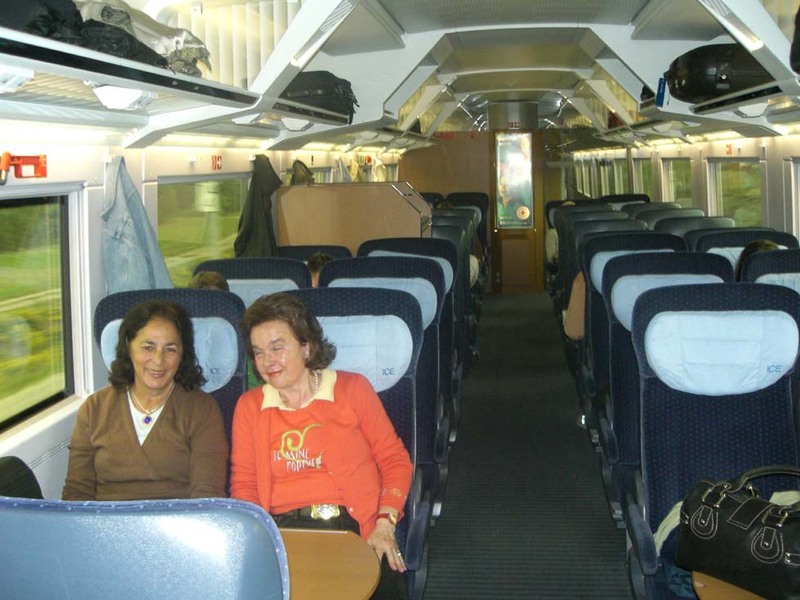 In contrast to other countries, seat reservation is not compulsory and on some days ICE trains were so crowded, that passengers were sitting on the floor, even in the buffet room. The new streamlined twin-deck TGV Duplex and TGV POS were designed by Roger Tallon. Refurbishing TGV interiors was done by fashion designer Christian Lacroix in a somewhat surprising style. The yellow/pastel/black TGV-based Eurostar got a new interior, not as cozy as Philippe Starck had proposed. Aesthetic highlight is the ICE3, styled by Alex Neumeister Design in hi-tech purity like the maglev "Transrapid", influenced by Bauhaus tradition and the Hochschule fuer Gestaltung Ulm. From a lounge passengers had even a look into the cockpit! Then came other futuristic designs by Giugiaro and Pininfarina. Some other design proposals were not as beautiful). A h Among the highlights of modern architecture are the Lyon airport station by architect Calatrava and the new Berlin Hauptbahnhof, designed by Meinhard von Gerkan, inaugurated in 2006. Europe united, but for a long time high-speed trains had been barred from crossing the porous borders. Under those conditions the fast day train Hamburg - Rome, an unpublished dream on timetable conferences decades ago, probably never will materialize. When in 2008 the EC Munich - Rome was stopped (being diverted to Rimini, then abandoned), every illusion vanished. In December 2009 DB, OeBB and LeNord of Milan changed traffic Munich - Milan under new EU rules to an "open access basis… as Trenitalia (FS) was focusing more and more on its national services" (Railway Gazette Intl, March 2010). The use of Austrian RailJet stock must be waited out and the service Munich - Milan was stopped by Italian lawsuits (as DB insiders informed). But tItalian hostility towards connections to Slovenia and beyond was reported, too. The TGV Paris - Milan had been successfully introduced before, connecting with an ETR500 Milan -- Rome. 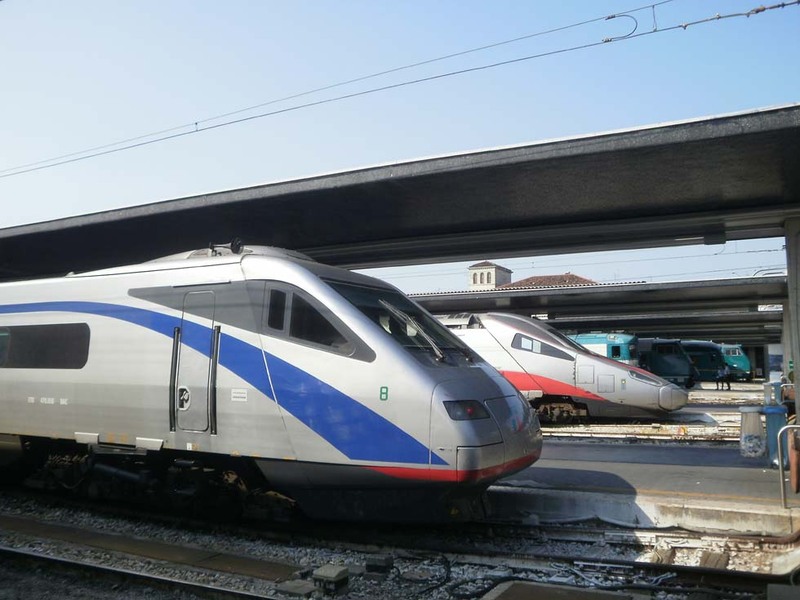 Years after the ETR460 on the Modane line had failed, Italy has prepared an ETR500 version with 8 instead of 12 trailers for Milan - Paris services. 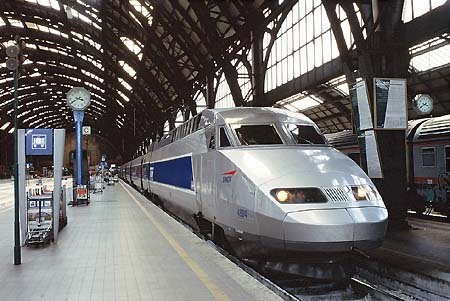 For 2010-20 a direct TGV or ETR500 Paris - Rome has become envisioned - the dream of a modern Rome-Express successor, while the traditional night-express Paris - Rome was stopped in 2012. 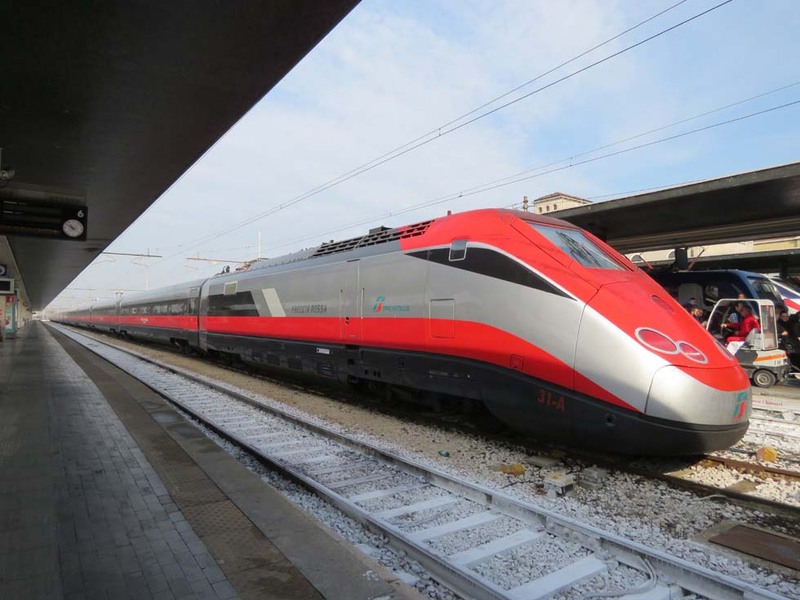 In 2008 the International Herald Tribune informed: "Italian entrepreneurs are planning the country's first private train service, which is set to begin in 2011 (…). 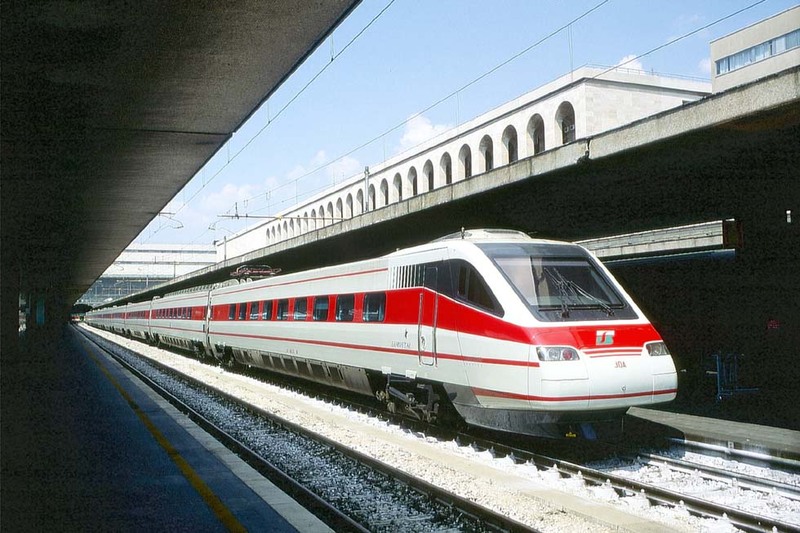 The new rail company, NTV, is a 900 million euro project that would link Rome. 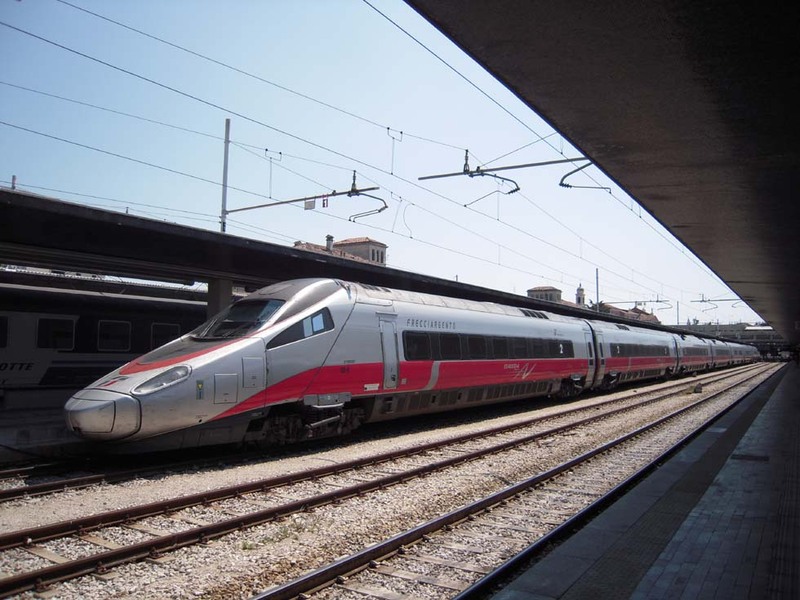 The service would run on the existing Italian rail network, using 25 11-car AGV high-speed trains made by Alstom. NTV or Nuevo Trasporti Viaggiatori was initiated by Ferrari boss Luca Montezemolo, participated by investors from the Italian industry and financial markets, joined also by French railways SNCF (is this the reason why SNCF's high-speed TGV was no longer allowed to enter Milano Centrale?). It's no wonder that the trains, labelled "Italo" and laid out for a speed of 360km/h, are painted dark-red, almost like Ferraris. Thus it competed with the state railways' ETR600 "Frecciargento" (the "Silberpfeil"). Like the TGV and the ICE2 or 3, two units may be coupled to form a large train set. And like the ICE3, they have distributed power. 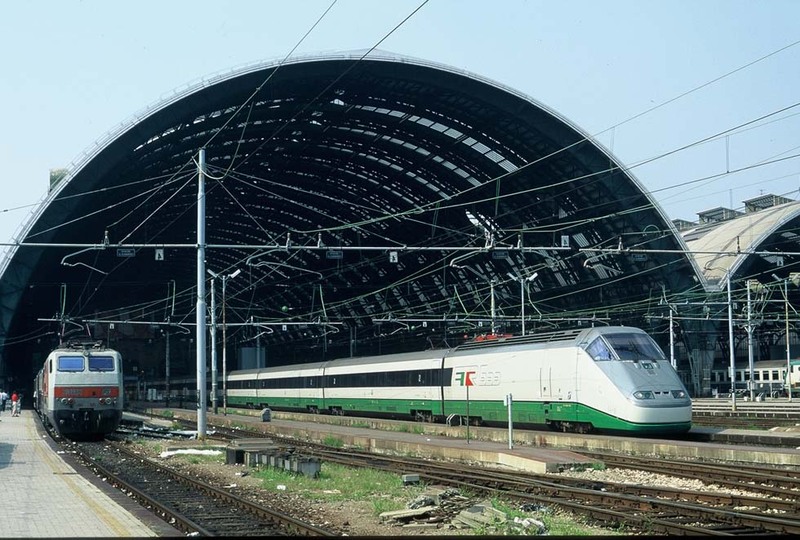 Liberalization of the Italian railway market is the result of the politics of the former minister Bersani under the Prodi government and hope arose that NTV would not be strike-ridden like FS. However, only domestic services were announced for starting in 2012: Milan - Rome nonstop and Venice - Rome. On the contrary, state railways FS ("Trenitalia") under Mauro Moretti announced for their new "Zefiro" high-speed trains also international services. 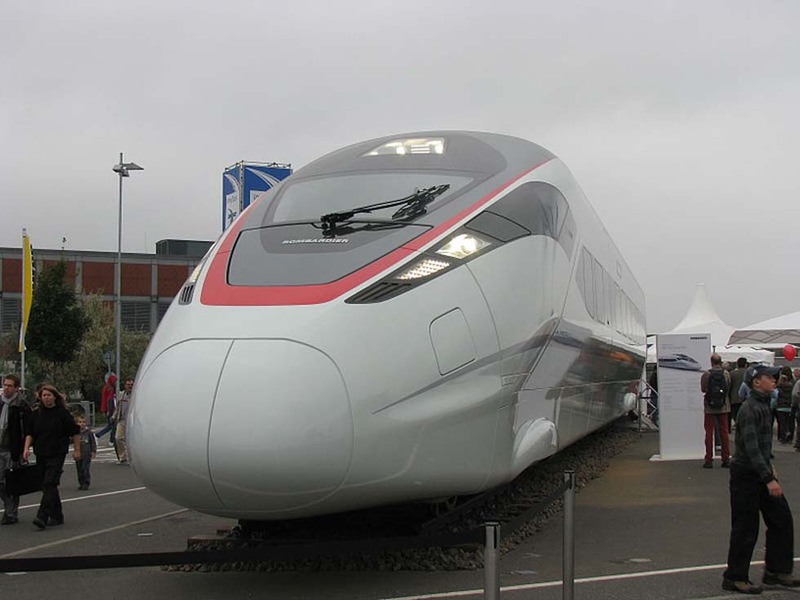 It's a derivate of Bombardier's Zefiro for China, built by the Ansaldo-Breda works, laid out for 360km/h. With these train sets, also FS gave up the antiquated principle of heavy engine units in favor of distributed power. Interconnecting Europe with a high-speed network is a continuous political struggle. For latest information see the Internet, books and magazines. But information is dependent on sources, reporting e.g. 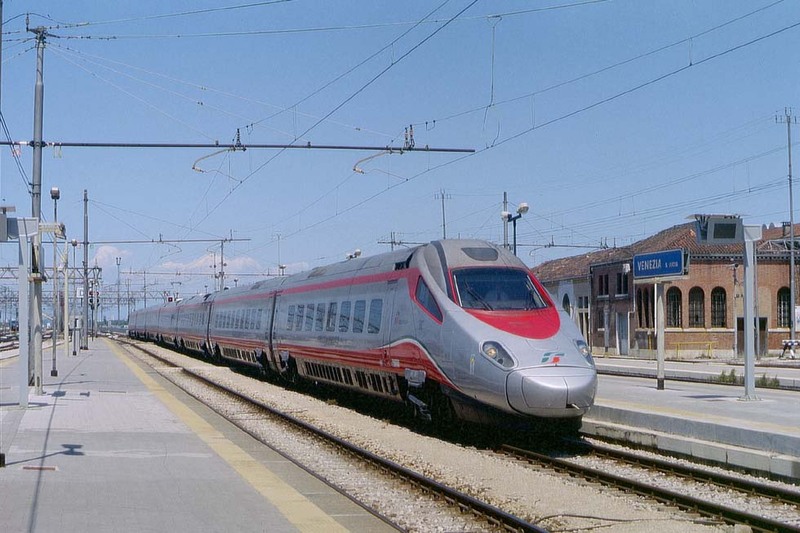 the Italian ETR500 correctly as Frecciarossa, but the upgraded Freccia Rossa 1000 for 350km/h either as ETR400 or ETR1000. The year means the start of services. L + 7T, derivative from ICE1, also 2 trains coupled. The trains which then were used by GNER had 14 cars and 2 engine units. L=locomotive-like BoBo engine unit, M = car with powered axles (TGV Sud-Est, Eurostar first bogie powered), T = trailer.